The Papandayan Jazz Fest became the new name of this annual Jazz Festival held by The Papandayan Hotel. 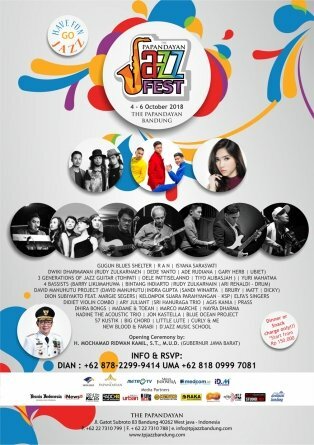 This highly anticipated festival on October will be filled with the sound of jazz from various top-notch musicians as the fourth annual Jazz Festival returns to The Papandayan. Various acts will perform across different venues in the hotel between October 4th until October 6th 2018, but will start kicking up the mood with a street performance on “INTERUPSI JAZZ” on September 26th at Jalan Braga featuring 5 Petani, and September 29th at Jalan Asia Afrika with Garhana. All performances on 4-6 October 2018 will include either a light & heavy snacks or all you can eat dinner at The Pago Restaurant. Entry pass on events are vary based on the performer and venue. 1.all performances at Mirten Lounge, TP Stage, Tropical Garden, and Pool Deck. GUGUN BLUES SHELTER, NEW BLOOD, MADAME & TOEAN, MARCO MARCHE, JON KASTELLA, TRIO GITAR (TOHPATI I OELE PATTISELANO I TIO), DAVID MANUHUTU PROJECT (DAVID MANUHUTU, INDRA GUPTA, SANDI WINARTA,BRURY & MATT), & DIDIT VIOLIN COMBO . DWIKI DHARMAWAN, LITTLE LUTE, DION SUBIYAKTO FEAT MARGIE SEGERS, 4 BASSIST (BARRY LIKUMAHUA, BINTANG INDIARTO, RUDY ZULKARNAIN, PRA BUDIDHARMA), NAYRA DARMA, ARY JULIANT, BIG CHORD, 57 KUSTIK, BLUE OCEAN, NADINE THE ACCOUSTIC TRIO, SANDI WINARTA, DJAZZ MUSIC SCHOOL.